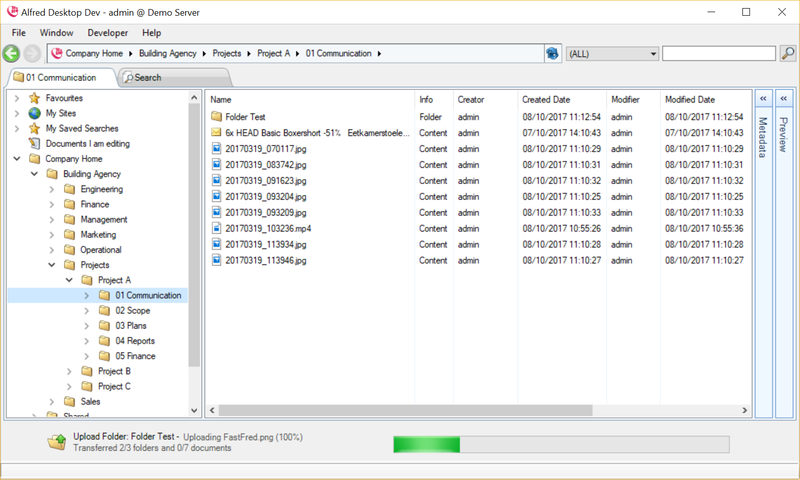 You can very easily add any kind of file to the Alfresco repository, by dragging and dropping the file from the desktop application into any folder within the Alfred Desktop window. The file will be uploaded into Alfresco. You can drag and drop multiple files simultaneously, or drag and drop multiple single files. While the documents are uploading, you can continue to navigate and work in Alfred Desktop. Uploaded documents are listed in the upload pane. Once uploaded, you will need to complete the metadata of the file. Where the document is of a general nature, you can use the base document type selected by default. Based upon the document type selected, a set of metadata fields will appear. According to the rules defined by your organization, some fields might be mandatory and others might be optional. 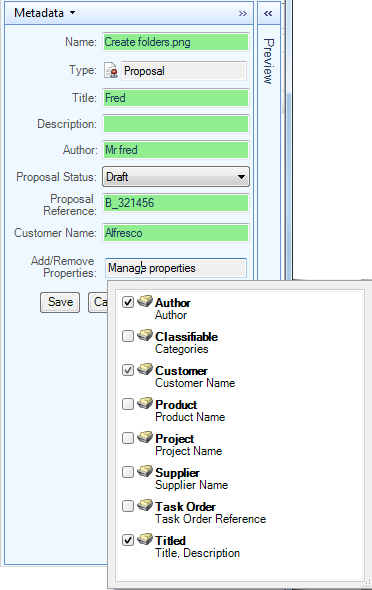 In the example below, the document type is a Proposal and the required fields (*) are Proposal Reference and Proposal Status. At the bottom of the metadata field related to a document type, a list with optional groups of metadata fields is presented. The user will decide if these optional metadata fields are relevant to the document, and if any of them should be added to the document. Click “Save” to finish the uploading of the file into the Alfresco repository. Other applications might also support the dragging and dropping of content, and could interact with Alfred Desktop. 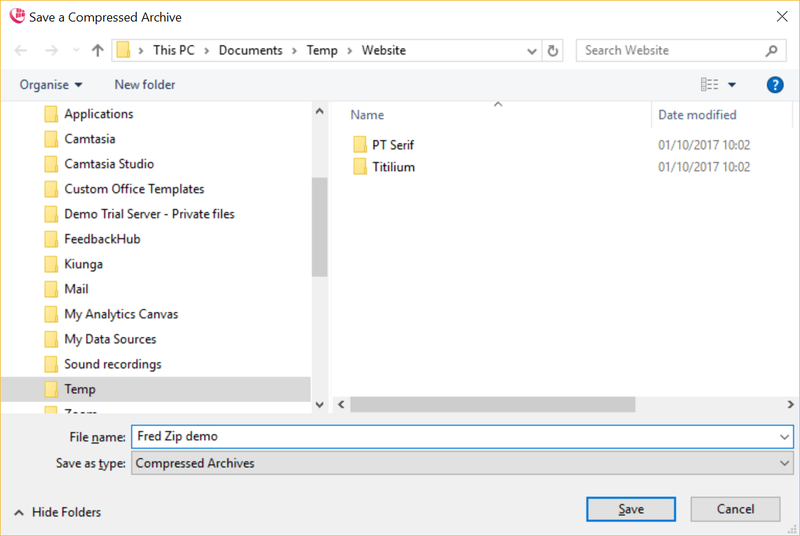 By checking if the application allows dragging and dropping of a file (including content) into MS Explorer or onto your desktop, you can test possible compatibility. If the initial test is successful, attempt dragging and dropping into Alfred Desktop. You can upload folders from your desktop or Explorer by dragging them into Alfred Desktop. An upload process will start, which indicates the number of subfolders and files that need to be/have been uploaded. During this process, the user does not receive an alert that metadata needs to be edited to complete the upload process. Important: you can only extend a folder structure whilst uploading a folder. 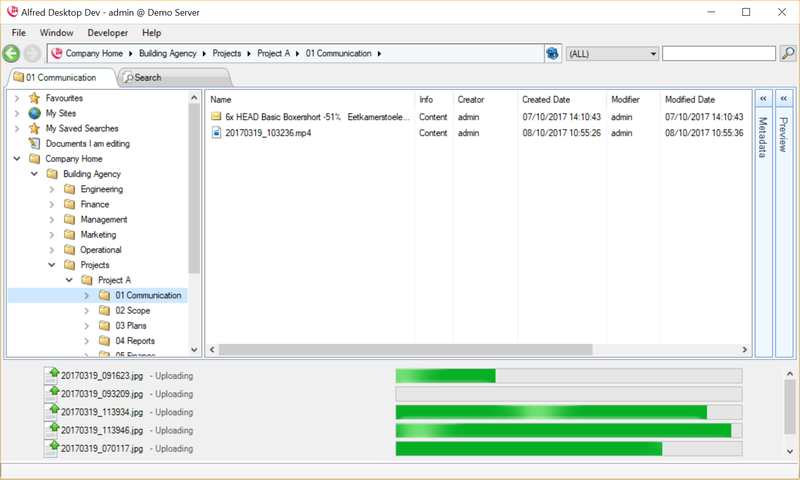 It is not possible to refresh/update the structure and content from a folder you have already copied to Alfred Desktop. 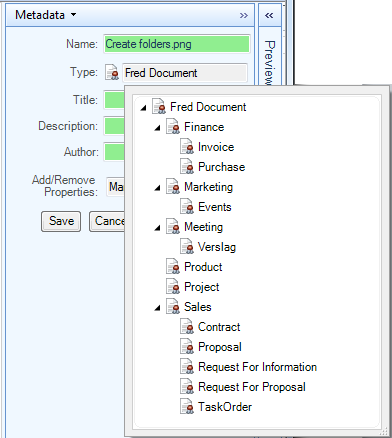 Adding documents (whether individually or collectively) to an existing folder structure is supported, and you are able to extend the folder structure whilst dragging a new subfolder structure into Alfred Desktop. You can select one or multiple documents and/or folders and compress then into a container, which will be saved to your local drive. Selecting a folder will compress all contents of the folder; that is, including the sub-folders and their content.